The destruction of tropical rainforests is having an even greater impact on the environment than was previously thought, a study suggests. Scientists have found that deforestation in Brazil is causing trees to produce smaller, weaker seeds that are less likely to regenerate. They believe this has been triggered by the loss of large birds from the forests, which have beaks big enough to feed on and disperse the seeds. Brazil’s Atlantic rainforest was once home to a vibrant array of plants and animals. But with the arrival of sugar and coffee plantations in the early part of the 19th Century, it was rapidly destroyed. Today, just 12% of the original forest remains. To assess the impact, researchers looked at more than 9,000 seeds collected from palm trees throughout the rainforest. Those taken from areas that had suffered heavy destruction were much smaller than seeds collected in undisturbed patches of forest. The researchers considered a wide array of factors that might have led to the shrinkage, such as the climate, soil fertility and forest cover. “But we found no evidence for any of those effects,” explained Prof Jordano, who carried out the research with Sao Paulo State University, in Brazil. Usually, species such as the toucan and cotinga use their large beaks to eat the fruit, eventually spreading the seeds throughout the forest. 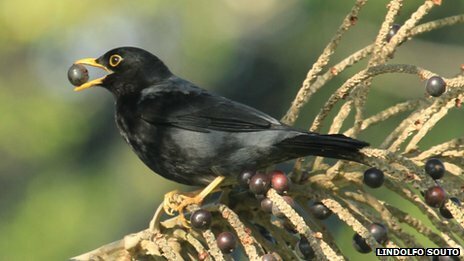 But as the rainforest was flattened, these birds vanished, leaving smaller birds behind such as the thrush. By evolving to produce smaller fruits, which birds with tinier beaks could handle, they were more likely to be dispersed. However the researchers found these seeds were weaker. 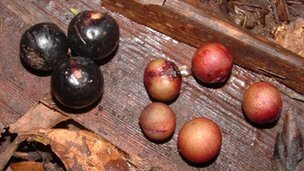 “Unfortunately the smaller seed size also means a lower probability for successful recruitment in the forest,” said Prof Jordano. He added that projected climate change could render rainforests drier and hotter, making the survival of the seeds even less likely. The researchers said their findings were probably not limited to the Atlantic rainforest. Prof Jordano said: “Really the story we are documenting can also be happening for many other tree species.